Here are some noteworthy moments covered on Twitter. First documentary video of the attack by journalist John Allan Namu. If you’re in the buildings under attack: look for cover (a quiet room will do). Put your phone on silent, switch lights off (if possible), and stay quiet. Don’t feel obligated to keep updating people (also, save phone battery). Just emailed/escalated to senior African @facebook execs to turn in the crisis response for Nairobi after #RiversideAttack at the Dusit and 14 Riverside area. This is a Twitter thread, but Facebook has more reach in a crisis. Everyone's asking "Who's this man?" An officer responded so fast that he wasn’t even able to wear the correct footwear then y’all keyboard ninjas and rumor mongers go ahead to share his pictures and brand him a terrorist! SHAME ON YOU!!!!!! No man should burry his child leave alone his two children at once. Mzee,Yassin Jama, Nairobi business man and owner of Kilimanjaro chain of restaurants lost two sons in the #RiversideAttack. Terrorism has no religion, tribe, or colour. Islam does not condone terrorism. I left the building as i was when the suicide bomber set off the explosion. I have no phone or any of my personal belongings but i escaped with the greatest possession of all. My life. Others were not so luck and i pray for their families. Guys also know that the @NPSOfficial_KE 999 number works, I called and it went through, that's how some of us were rescued!!! The foreign media, and the New York Times become a talking point. Situation updates by the Police. Can we help organise food and drink for the security forces and LFH guys still at 14 Riverside? Chai, mandazis, coffee, donuts, porridge etc? Its been a long night for them while we slept and they are still on the ground. Corporate support for the responders. Yes individuals who were at Dusitd2 got a temporary accommodation. We're awaiting authorities to give the go ahead on retrieving guest and staff property due to the evacuation. 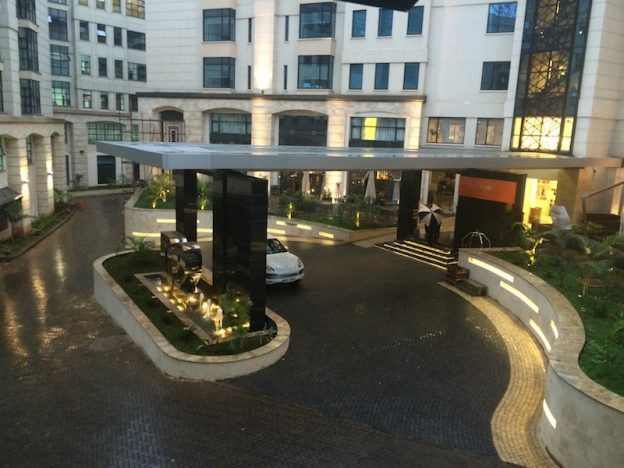 14 Riverside reopens on January 28. Remain vigilant! – US Embassy cautions. Bank manager charged with failing to report suspicious funds transactions linked to the attack. What other notable tweets did you see this week? This entry was posted in Terrorism, Twitter and tagged 14 Riverside, Nairobi, Terrorism on January 20, 2019 by bankelele. 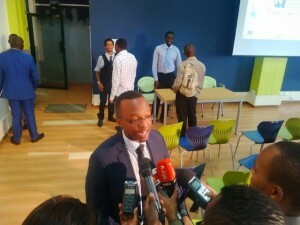 WhatsApp to Replace Twitter as Kenya’s Corporate Darling? This week, Nendo Ventures and OdipoDev published a Social MediaTrend Report that analyzed recent trends. These included usage and messages on WhatsApp, Facebook, and over 5 million twitter Kenya messages sent in the last year that spiked during events such as the March 2013 presidential election, the Westgate Mall terror attack and the Kenya@50 independence celebrations. 1. WhatsApp will change the media in 2014-15: With 82% of Kenyans having phones, and 19% with smartphones, WhatsApp which is pre-installed on some phones, is becoming used more and more for sharing of pictures, video, audio, and chats – and they predicted it will become the default communication channels for businesses. Already Citizen has Road Hog and Chase Bank has launched a dedicated WhatsApp channel. While it’s questionable if Kenyan corporations, having recently embraced Facebook and Twitter, will migrate to WhatsApp, the authors cited the fact that WhatsApp is pre-installed on some phones, and has a very low barriers to entry (compared to Twitter that requires an e-mail address and some internet knowledge). 2. Social TV changes everything. This is the age of the second screen where people watch TV, attend events with mobile phones in their hand and chat & comment on social media. In Kenya, it’s also known as the “Tujuane” syndrome after a local dating TV show that has recorded as many as 9,200 tweets an episode – and it opens a new way for for more advertising and communication from companies to connect with customers. 3. Social media Devolves – it will devolved to counties – and citizens will set out to claim their web presence and self organize like some groups in Wajir already have. Somewhat related, the 2014 Kenya blog awards highlighted some cool county-focused blogs from Uasin Gishu, Kisumu, Mombasa and Baringo. – The establishment of the smart audience – and the authors estimate Kenya has a smart audience of 0.5 million on twitter and 3.8 million on Facebook and TV and other media organization, now use Twitter, rather than SMS as their preferred interaction and feedback channel. – The role of online media in personal security like the government’s proposed Nyumba Kumi (10 homes) neighborhood watch system. – Fun Fact While they also predicted that this year will see more transparency on the paid interaction between brands and influencers/bloggers to, everyone wanted to know which corporations are paying Kshs 10,000 to 30,000 ($350) per tweet to influencers. 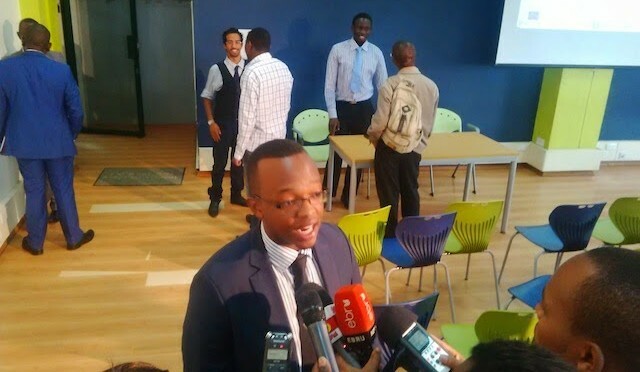 This entry was posted in corporate blogging, Media in Kenya, Twitter on March 21, 2014 by bankelele. This week, Equity Bank went live on twitter – and joined other top bank groups in Kenya in their use of social media to respond to customer issues. 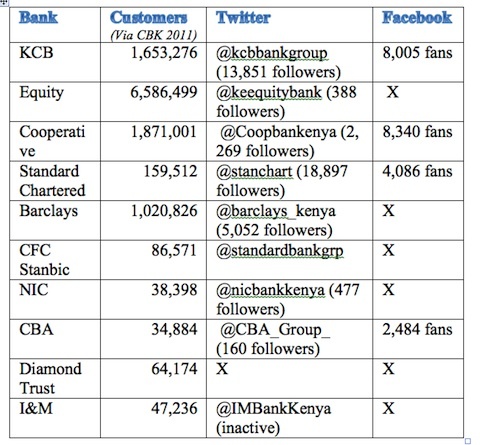 About half of Kenya’s 46 banks are now on Twitter ( see this list of local banks on twitter), but as the table below shows, the number of bank customers likely to use social media is a small fraction of the total numbers. While Facebook is a powerful medium for banks to convey news and products promotions (some even tweet links to longer pieces or videos on Facebook, not their own websites) and get feedback, Twitter is equally as powerful on but for customers as it gives them the ability to tag a bank manager or CEO’s or any widely watched trend such as #twitterthumbsup (for good customer service) or #twitterbigstick for bad customer experiences. In the Bob Collymore era, Safaricom has raced to be the acknowledged corporate leader in Kenyan social media with 363,337 Facebook fans and two widely followed twitter channels – including one dedicated to customer care issues with over 47,000 followers – but this is a company with over 19 million customers. This entry was posted in Bank rankings, customer service, Equity Bank, Safaricom, Twitter on May 1, 2013 by bankelele.